15°C, rain, lots of it. Big Digger: actually a JCB thing. It’s loosely based on the machines I can see out of the window from here, the working model is built from scratch like a "speed-modelling" exercise. Note: I didn’t make the derelict buildings, they were a freebie from Beaumont from ages ago. There is a video to go with it, but it reveals a problem with forward-kinematics hierarchy*. The pistons all work- pointing the right way, the caterpillar tracks are a solid object, so no articulation there, I wonder if it’s possible to use an animated map instead of animation the geometry. Version 2: on a roll with this one, there are numberous changes, mainly fixed the problem with *linkages based on the world-grid instead of the object’s parent. The wheels look less like a kiddies toy, and the animation has 2 particle systems for falling rubble. All done in Max’s native tools, no plugins. I don’t mind saying that this was hugely satisfying, it wasn’t free from problems, but they were all overceom and in a good time span too. It’s a job that left me feeling competant. 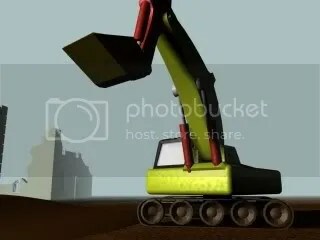 Why do a big digger? A= It’s my holiday job; let me explain. To make sure we don’t talk about teaching all holiday, we make up "virtual careers" for each holiday. In the past I have been a fletcher, a bodger, a stone mason (note the hearty traditional roles there). My career this holiday is being a Big Kid, so I have to get excited about the big diggers. And there are a whole load of them visible from this room. Linseed: added the long-awaited crane flys to the Pointers picture. There are five crane flys in there now, possibly more to come. This was a long session, 1½ hours. A nice way to spend a rainy October day.